Your guitar is more than just an instrument, it’s a magic music machine and your best friend. That’s why it’s important to clean your guitar to keep it playing like a dream. Even if you just play a little at home dust can build up, metal can tarnish and electrical parts can get damaged. If you’re out and about playing gigs then it gets even worse. Spilled drinks, sweat and who know what threaten your baby at every turn. Cleaning your guitar takes a little time but it’s well worth it. Set aside an afternoon and make an event of it. You’ll appreciate your instrument all the more when you take care of it and it will pay you back by sounding great when you play. Soft Cloth: A good soft cleaning cloth is tool number one. You can pick up packs of microfiber cleaning cloths cheap so you have extras. Remember, the softer the better so you don’t ruin any paint finishes. You can get a pack of these cleaning cloths on Amazon, they’re the type most commonly found in guitar cleaning kits. Cleaner: You can get fancy guitar cleaning spray or you can just use a basic window cleaner. Just make sure it’s non-ammonia. Pick up a travel spray bottle at any retail store if you want to make a small bottle to take with you. Polish: Most guitar companies make guitar polish that you can use to restore your finish while cleaning your guitar. This isn’t for every cleaning but a good idea once in awhile. It will make things shiny again and help buff out some small scratches. Fretboard Conditioner: Your fretboard takes lots of punishment. Using some fretboard conditioner a few times a year can keep the wood in good shape. Steel Wool: A common way to cut severe grime on the fretboard is to use ultra-fine steel wool. Make sure it’s #000 or #0000. Anything coarser can cause deep scratches and ruin your fretboard. Kits: Most guitar makers sell kits with most of these products for cleaning your guitar. They’re a great way to get the basics in one pack. Pick up extra cleaning cloths though since you’ll want to replace those every so often. If your kit didn’t come with a case, pick up a cheap cosmetics case for a few bucks. You’ll want to do a general cleaning on your guitar after every time you play for a few hours and as soon as possible after a gig. This doesn’t have to be much. Usually just a quick wipe down with a cloth is all it takes. Keep an eye out for any scratches or any nasty grime you picked up. After you’re done keep it’s recommended to keep your guitar in a case. Putting it on display is great but outside a case it can collect dust and you’ll have to clean your guitar more often. 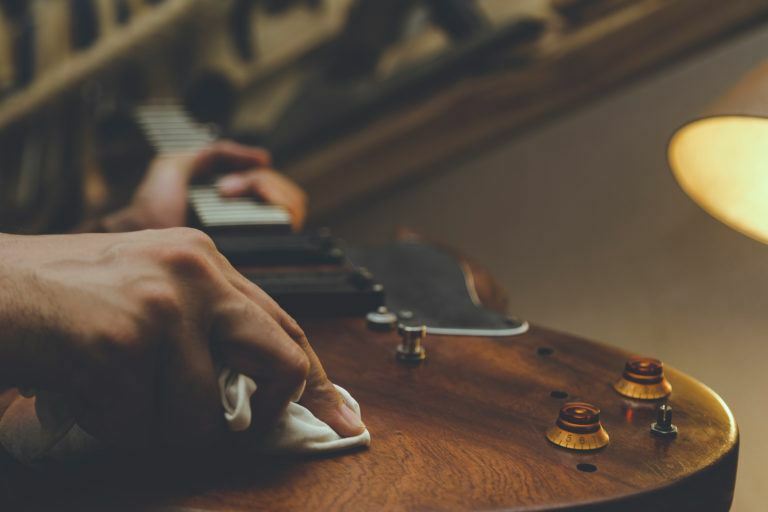 A few times a year you’ll want to do a full cleaning on your guitar. This is when you want to pop in a movie, get comfortable and go to work. General cleaning is great but sweat and oils from you hands build up over time leading to grimy deposits. Then there’s the other things you pick up from playing outdoors and in clubs with questionable cleaning habits. Setup: Find a good place to clean your guitar with ample light and room to lay out your supplies. A large coffee table or kitchen table works great. To begin with, wipe down of the entire guitar. Use this time to spot trouble spots, scratches and any tarnish on metal pieces. If you need to, use a little spray cleaner to bust up stuck on dirt. Strings: When you’re cleaning your guitar it’s a good time to change your strings as well. Remove your old strings to get better access to your fretboard, pickups and other parts. Fretboard: If you have buildup on your fretboard you can remove it with the steel wool. If you do this on an electric guitar, be sure to cover the pickups. Getting metal from the steel wool in your electronics while cleaning your guitar can lead to some big problems. Condition: After the fretboard is clean, use some of the fretboard conditioner. Follow the directions on the bottle to keep your fretboard healthy. Pickups: Check your pickups for tarnish or rust. If there is any you’ll want to be careful. Remove the pickup and use a special tarnish remover. Do not use your steel wool! Also you can blow out any dust from under the pickups with some canned air or simply wipe it out. Polish: When you’ve cleaned the guitar you can get to polishing. Use the polish to give your guitar’s finish a shine again. If you have small scratches, use a little extra polish and buff them out with your cleaning cloth. **Note: Old guitars need extra care. Be gentle polishing them as you can literally polish the finish right off. You might want to consult someone experienced if it’s your first time cleaning a classic guitar. Restring: After you’re all done polishing and cleaning your guitar, restring it with new strings and tune it up. Do a final wipe down to remove fingerprints and put it back in the case. Don’t have a case? 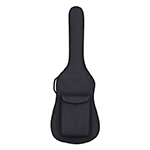 Get a gig bag on Amazon to protect your guitar. Totally worth it.